Inactive Ingredients: Hydrogenated vegetable oil, magnesium stearate, polyethylene glycol, polyvinyl alcohol, silicon dioxide, talc and titanium dioxide. Yellow tablets also contain D&C Yellow No. 10 aluminum lake and FD&C Yellow No. 6 aluminum lake. Blue tablets also contain FD&C Blue No. 1 aluminum lake and FD&C Blue No. 2 aluminum lake. Increased urinary potassium excretion is first observed 1 hour after administration of Klor-Con® Extended-release Tablets, reaches a peak at 4 hours, and extends up to 8 hours. Mean daily steady-state plasma levels of potassium following daily administration of Klor-Con® Extended-release Tablets cannot be distinguished from those following administration of potassium chloride solution or from control plasma levels of potassium ion. Hyperkalemia (see OVERDOSAGE): In patients with impaired mechanisms for excreting potassium, the administration of potassium salts can produce hyperkalemia and cardiac arrest. This occurs most commonly in patients given potassium by the intravenous route but may also occur in patients given potassium orally. Potentially fatal hyperkalemia can develop rapidly and be asymptomatic. Interaction with Potassium-sparing Diuretics: Hypokalemia should not be treated by the concomitant administration of potassium salts and a potassium-sparing diuretic (e.g., spironolactone, triamterene or amiloride), since the simultaneous administration of these agents can produce severe hyperkalemia. Interaction with Angiotensin Converting Enzyme Inhibitors: Angiotensin converting enzyme (ACE) inhibitors (e.g., captopril, enalapril) will produce some potassium retention by inhibiting aldosterone production. Potassium supplements should be given to patients receiving ACE inhibitors only with close monitoring. Gastrointestinal Lesions: Solid oral dosage forms of potassium chloride can produce ulcerative and/or stenotic lesions of the gastrointestinal tract. Based on spontaneous adverse reaction reports, enteric-coated preparations of potassium chloride are associated with an increased frequency of small bowel lesions (40-50 per 100,000 patient years) compared to extended-release wax matrix formulations (less than one per 100,000 patient years). Because of the lack of extensive marketing experience with microencapsulated products, a comparison between such products and wax matrix or enteric-coated products is not available. Klor-Con® Extended-release Tablets are wax matrix tablets formulated to provide an extended rate of release of potassium chloride and thus to minimize the possibility of high local concentration of potassium near the gastrointestinal wall. Prospective trials have been conducted in normal human volunteers in which the upper gastrointestinal tract was evaluated by endoscopic inspection before and after one week of solid oral potassium chloride therapy. The ability of this model to predict events occurring in usual clinical practice is unknown. Trials which approximated usual clinical practice did not reveal any clear differences between the wax matrix and microencapsulated dosage forms. In contrast, there was a higher incidence of gastric and duodenal lesions in subjects receiving a high dose of a wax matrix extended-release formulation under conditions which did not resemble usual or recommended clinical practice (i.e., 96 mEq per day in divided doses of potassium chloride administered to fasted patients, in the presence of an anticholinergic drug to delay gastric emptying). The upper gastrointestinal lesions observed by endoscopy were asymptomatic and were not accompanied by evidence of bleeding (hemoccult testing). The relevance of these findings to the usual conditions (i.e., non-fasting, no anticholinergic agent, smaller doses) under which extended-release potassium chloride products are used is uncertain; epidemiologic studies have not identified an elevated risk, compared to microencapsulated products, for upper gastrointestinal lesions in patients receiving wax matrix formulations. Klor-Con® Extended-release Tablets should be discontinued immediately and the possibility of ulceration, obstruction or perforation considered if severe vomiting, abdominal pain, distention or gastrointestinal bleeding occurs. Metabolic Acidosis: Hypokalemia in patients with metabolic acidosis should be treated with an alkalinizing potassium salt such as potassium bicarbonate, potassium citrate, potassium acetate or potassium gluconate. General: The diagnosis of potassium depletion is ordinarily made by demonstrating hypokalemia in a patient with a clinical history suggesting some cause for potassium depletion. In interpreting the serum potassium level, the physician should be aware that acute alkalosis per se can produce hypokalemia in the absence of a deficit in total body potassium while acute acidosis per se can increase the serum potassium concentration into the normal range even in the presence of a reduced total body potassium. The treatment of potassium depletion, particularly in the presence of cardiac disease, renal disease or acidosis requires careful attention to acid-base balance and appropriate monitoring of serum electrolytes, the electrocardiogram and the clinical status of the patient. • To take each dose with meals and with a full glass of water or other liquid. • To take this medicine following the frequency and amount prescribed by the physician. This is especially important if the patient is also taking diuretics and/or digitalis preparations. 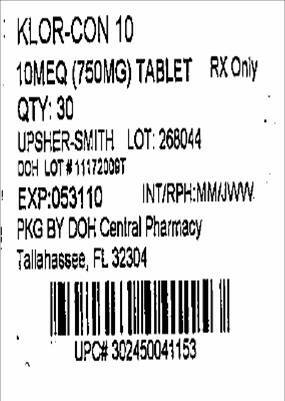 • To check with the physician if there is trouble swallowing the tablets or if the tablets seem to stick in the throat. • To take each dose without crushing, chewing or sucking the tablets. Laboratory Tests: When blood is drawn for analysis of plasma potassium it is important to recognize that artifactual elevations can occur after improper venipuncture technique or as a result of in vitro hemolysis of the sample. Drug Interactions: Potassium-sparing diuretic, angiotensin converting enzyme inhibitors (see WARNINGS). Carcinogenesis, Mutagenesis, Impairment of Fertility: Carcinogenicity, mutagenicity and fertility studies in animals have not been performed. Potassium is a normal dietary constituent. Pregnancy: Pregnancy Category C. Animal reproduction studies have not been conducted with Klor-Con® Extended-release Tablets. It is unlikely that potassium supplementation that does not lead to hyperkalemia would have an adverse effect on the fetus or would affect reproductive capacity. Nursing Mothers: The normal potassium ion content of human milk is about 13 mEq per liter. It is not known if Klor-Con® Extended-release Tablets have an effect on this content. Since oral potassium becomes part of the body potassium pool, so long as body potassium is not excessive, the contribution of potassium chloride supplementation should have little or no effect on the level in human milk. Geriatric Use: Clinical studies of Klor-Con® Extended-release Tablets did not include sufficient numbers of subjects aged 65 and over to determine whether they respond differently from younger subjects. Other reported clinical experience has not identified differences in responses between the elderly and younger patients. In general, dose selection for an elderly patient should be cautious, usually starting at the low end of the dosing range, reflecting the greater frequency of decreased hepatic, renal or cardiac function, and of concomitant disease or other drug therapy. 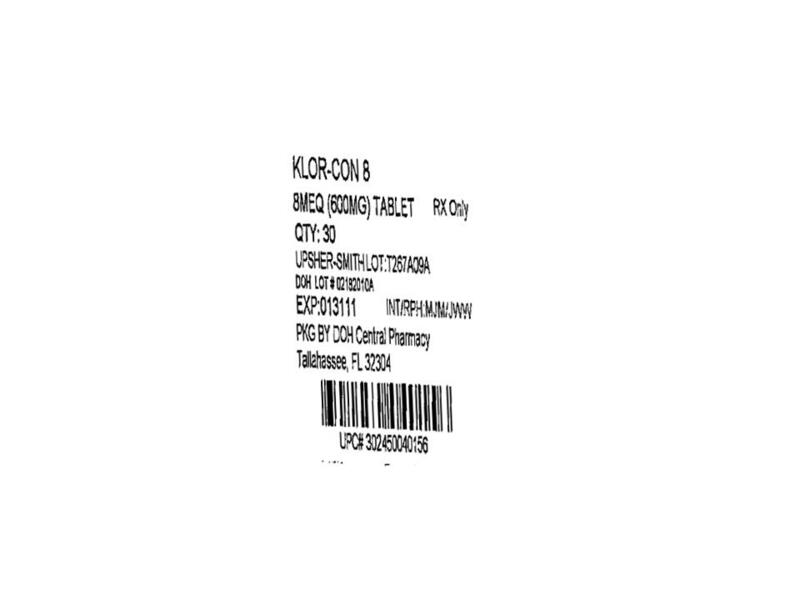 Film-coated Klor-Con® 8 (light blue, debossed with â€œKC 8â€), Klor-Con® 10 (yellow, debossed with â€œKC 10â€), round tablets.